Calming Coconut Knots & Tangles Shampoo which includes a mild non-irritating formula that reinvigorates dry and damaged coats; Tropical Pineapple Seriously Dirty Shampoo, specially formulated to counteract foul smells and remove stubborn dirt from a dog’s coat. It contains extract of Aloe Vera to leave the coat soft & shiny; Mellow Mango Moulting Dog Shampoo, created to help remove tangles and dead hair whilst softening the coat; Exotic Berries White Dog Shampoo, this adds brilliance and sparkle to any white coat with its special formulation; Natural Aloe & Bamboo Sensitive Shampoo designed to soothe dry and scurfy skin with its Aloe extracts; Juicy Passion Fruit & Peach Puppy Shampoo has a gentle skin kind formula that leaves the coat feeling healthy and refreshed; and finally, Crisp Pear Cat & Kitten Shampoo with a gentle formula that’s kind to the skin and has reduced lathering properties so less rinsing is required. 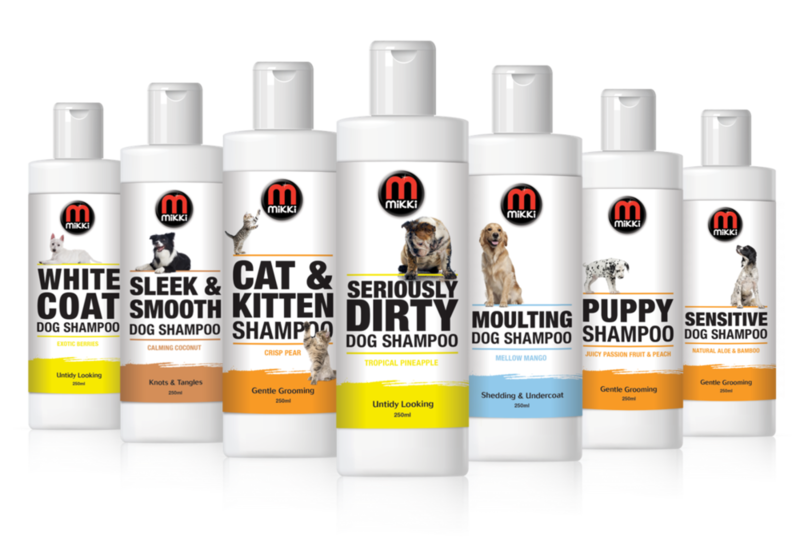 The Tropical Shampoo range is the latest addition to Mikki’s five step grooming programme designed for the everyday pet owner.